Giving money to charities that feed the hungry etc. When a Christian minister friend posted on his Facebook page an exhortation that we, especially Christians and the churches we belong to, give to charities, like Oxfam, in order to help those who are impoverished around the world, e.g. through hunger, it got me thinking what is my approach and what does the Bible say. There is no doubt that the Bible says a lot about feeding / caring for the poor and needy and our responsibilities toward such. Christians down the centuries have often led the way by showing compassion, evidenced by the monumental number of charitable good works they helped initiate and get involved with. I have to admit though that personally speaking I hardly ever give to charities like Oxfam and part of the reason is my questioning if it is best use of giving. The thought of highly paid chief executives and reports of corruption and money not going to where it is most needed are reasons for this and, besides, there are so many other ways we can give to the needy. The needs are huge and with us all the time and not only when we hear news of yet another disaster. I should also add that while charity might begin at home, it doesn’t end there but rather it needs to extend globally. While there is no right and wrong concerning who to give to, other than the principle that it is right to give generously, I favour entities that not only exercise proven good stewardship in the way they handle charitable donations but who take a holistic approach, something in this day of political correctness is becoming harder to do. It is why I like to give to those who unconditionally serve all faiths and none, but whose ethos is Christian and who are not afraid to share the Christian message. 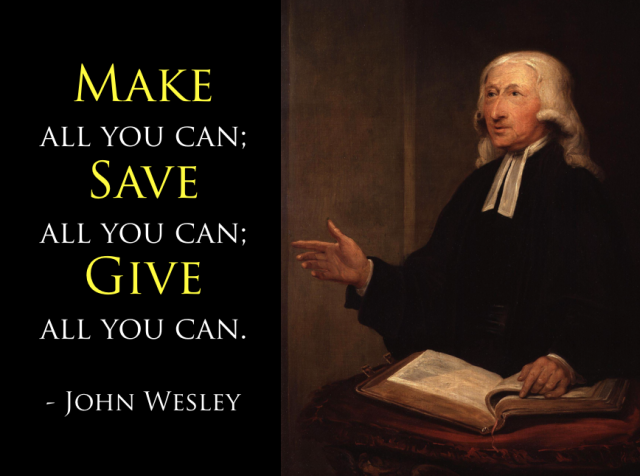 I ought to make a few observations about money and the person I refer to on this matter is John Wesley, the founder of Methodism, who on the matter of stewardship was spot on. Throughout his life, he lived modestly and gave away most of his wealth to where the need was most and yet that did not preclude wise investment of whatever wealth one does possess and making money providing we do so as good stewards of God’s good gifts. While I have followed the Wesley principle for most of my life, I wouldn’t award myself an “A” because I could and should have earned more, given more away (including trusting the Lord more) and lived more simply. Where we give our money is a personal matter and it is not one I want to interfere with. I certainly admire most those who adopt Wesley like principles and those churches with a heart for giving and do so wisely. Like some I am outraged when churches indulge in expensive building projects or pay their ministers disproportionate amounts, or invest in vanity projects, although decent buildings may be needed and taking care of the shepherds of the flock is important as is attending to the needs on our doorstep. I love the text about God loving a cheerful giver and it is the folk who give simply because they see a need that I respect most, although many who excel in this matter try to hide the fact they do so, adopting the principle of the left hand not knowing what the right hand is doing. The needs around us are plenteous. Having spent 25 years as a church missionary secretary, I know all too well of the multitudinous needs. Often I wept when ministries, including compassion ones, closed down due to lack of finance, although often there are other factors including sadly a lack of vision, without which the people perish. When it comes to giving to the poor and needy e.g. in the light of humanitarian disasters, I prefer to give to organizations, like the Barnabus Fund that support Christian ministry and operate in a holistic fashion and exercise good stewardship by giving to where the need is most, that make best use of what comes their way. But it is a personal matter who to give to. If what Christians believe is true, we serve a mighty God, who does provide, often through His people. If I have a personal maxim it is God gives to us so we can give to others, and we can’t out give God.